If you are one of the many recreational boaters who enjoys wake sport activities, you may be unwittingly contributing to the spread of aquatic invasive species (AIS). Be sure to fill and empty your boat’s ballast tanks at least a mile offshore over deep water. The first line of defense against aquatic invasive species is preventing them from arriving in new water bodies. Once established, it is difficult to prevent their spread and nearly impossible to totally eradicate them. This reality is why the Lake Tahoe Basin enacted mandatory boat inspections for all motorized watercraft recreating on the basin’s pristine water bodies. The strategy is to prevent the spread before boaters launch. This strategy accepts the common, and often true, belief that once a new species is in a lake it will naturally migrate to, and populate all suitable habitat. However, some water bodies have natural barriers that prevent the movement of certain species within their aquatic realm. Asian clams began to spread around the Lake Tahoe shoreline in the early 2000s. By casting their offspring (veligers) loose on lake currents, the clam population was able to expand. Soon bright white patches of clam shells could be seen on the sandy bottom along the southeast portion of the lake. Over the following four years the density of clams increased, but their range had approached its natural limit. After 15 years in the lake, the clams remained isolated in the southeast. Lake Tahoe is unique. Its underwater topography (bathymetry), cold temperature, and large-scale lake currents create a natural deterrent to the lake-wide distribution of organisms unable to propel themselves through its clear water. Steep canyons separate its shallow shelves, and its currents form three counter rotating gyres that turn alongshore motion toward the center of the lake. It is believed the combination of great depth nearshore and Tahoe’s prevailing currents create a natural barrier to Asian clam migration to the north and west shores. Asian clam veligers need to settle on suitable habitat shallower than 60 feet deep to experience warm enough summer water temperatures to grow and eventually reproduce. Those settling in deeper water will live a long and happy life, but will never enjoy the pleasures of parenthood as the water temperatures are too cold to permit reproduction. Given that, how did satellite populations of Asian clams end up at the mouth of Emerald Bay and the Sand Harbor State Park boat launch? Recreational boating may inadvertently be the culprit. How is this possible when all boats are inspected prior to entering the lake? It is believed recreational boats equipped with ballast tanks are responsible for the in-lake transport of Asian clam veligers beyond their natural distribution. About five years ago there was a large increase in wake surfing. The surge in interest was partially due to new boats designed with ballast tanks. After launching, the ballast tanks are filled with as much as 375 gallons of lake water. With this extra weight, a large wake is created, allowing hands free surfing on an endless wave for skilled riders. Once the surf session is complete, the ballast tanks are emptied, rarely in the location where they were filled. It is easy to see how boat ballast tanks may be responsible for moving clam veligers to the satellite locations of Emerald Bay and immediately in front of the Sand Harbor State Park launch ramp, two of the most popular boating destinations on the lake. While long-established boat inspections are doing their job preventing new species from populating waters of the Tahoe Basin, boaters need to be cognizant of in-lake transport and take simple precautionary measures. Remove and dispose of any aquatic vegetation from your prop, engine intake or keel before exiting the launch or marina. Ballast tanks should only be filled and emptied in the same location or at least one mile offshore. This will keep any hitchhikers over deep water, away from warm shallow habitat. Additionally, the installation of commercially available filters on ballast tank pumps is highly recommended. A joint study by the University of Nevada – Reno and the Tahoe Regional Planning Agency found the filters to be an effective measure against the transport of aquatic species. 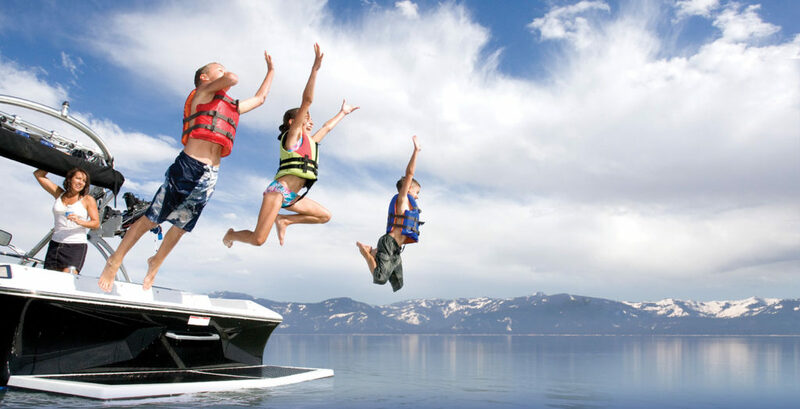 So, enjoy the recreational opportunities Tahoe summers afford, but be a responsible boater. Prevent further spread of the aquatic invasive species already in the lake by filling and dumping ballast tanks at least a mile offshore and removing plant material before leaving marina.